Meatballs. Meatballs. Meatballs! Slightly browned, round balls of ground meat, flavored with a handful of components that create happiness in your mouth. Texture and flavor are key to making the best meatballs. This is a meal that I start making early in the morning. Simmering the meatballs in the tomato sauce adds tenderness to the meat while adding a depth of flavor to the tomato sauce itself. There is always room for your creative touch and flavor. Making meatballs and tomato sauce is one of those things that is not exact in measurements. However, I do believe there are key ingredients that need to be used to create a certain texture and flavor. I’ve made my fair share of meatballs and sauce over the years. With that being said, I can tell you that a combination of ground meats is prime. 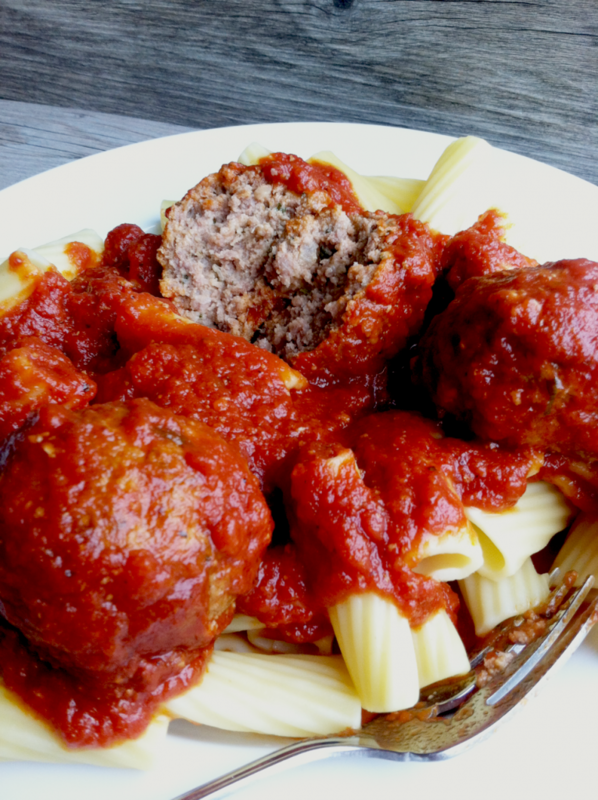 Using three meats – ground beef, ground pork and ground veal – is the trio that makes these meatballs the best. Fresh herbs are a nice touch if available. If not, dried are a nice backup. In a bowl combine all the ingredients. It’s important to mix the ingredients only until incorporated. Over mixing can lead to tough rubbery meatballs. If the meat mixture to too dry, add more milk. If it is too moist, add more breadcrumbs. Form meat into desired size (I used 1/3 cup – ½ cup size). Baking time will vary due to the size of meatball. Lightly spray a cookie sheet with vegetable spray then add rows of meatballs. Bake the meatballs about 30 minutes at 400° or until slightly browned. In a large saucepan, place meatballs into your choice of tomato sauce. The meatballs will continue to cook in the sauce and add flavor.